Breaking News for sky aficionados: June 2011: three eclipses - 2 partial solar, 1 total lunar - in one month! June 2011: three eclipses - 2 partial solar, 1 total lunar - in one month! June 2/1 (because the Int'l Date Line is crossed): Partial solar eclipse in the far North, with the greatest magnitude (mag. 0.6) in Russia. June 14: Saturn just 1/4° from bright star Porrima; the two are forming a nice 'double star' already now! June 15/16: Total eclipse of the Moon, best seen from E & S Africa and W Asia (websites from RSA, Pakistan and India) but also a little bit at the end from Central Europe. June 28: Dwarf planet Pluto in opposition at 14th mag. in 31 AU distance. July 1: Partial solar eclipse just off Antarctica - and nowhere else. D'uh! Meanwhile the morning planets show is coming to an end: some nice vistas of May 31 from Turkey, of May 30 from Germany (it's tough ...), of May 29 from the U.S. (more), of May 26 from Australia, of May 23 from S. Africa, of May 22 from Malaysia, of May 20 from Iran and Australia, of May 19 from New Zealand (more), of May 18 from Greece and Australia, of May 17 from high over Australia (at 39,000 ft! ), of May 16 from the U.S. and Tahiti and of May 15 from Cyprus. • Also a Mars close-up from May 26 (taken in Germany - in daytime) that shows quite some detail despite just 4" diameter and May views of Saturn's storm which was also studied in the IR. In other news unusual views of the Moon: in polarized light, used as a diffracting edge, in extreme libration and with impacts by 3 Eta Aquarids and one Quadrantid (some background on this kind of observation here and here). 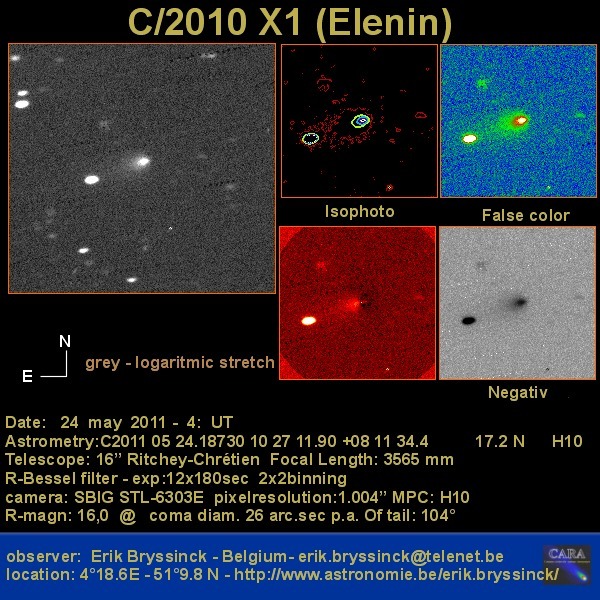 • Images of poor comet Elenin of May 24 and May 16 and what the future may bring (and what not). There are also a new comet C/2011 J3 (LINEAR) (more) - and pre-discovery observations (and non-observations) of C/2010 A2 (LINEAR). • Some bizarre (non-)impact stories: another megacryometeor mystery and weird circumstances of the Dryas (more) and Chiemgau non-impacts. • From the Sun May prominences (from every day from May 19 ... 26), the May 25 full Sun in H-Alpha and a May 9/10 CME movie, aurora over Tasmania on May 28, plus preventing space storm damage on Earth - and a weird scene from an art exhibition (headline - not connected to the pic - NSFW) ... • A star's proper motion in 110 years documented. • The first NLC sightings of the year are in; see also here. • Some post-processing of ESO movies showing Paranal rotating in a fixed Universe. • A rare timelapse movie of geostationary (or rather not so stationary!) satellites. • An Endeavour water dump (more). • And the ISS & Endeavour in front of the Sun with veeery high and not quite so high resolution (one more) - this low-res movie shows how fleeting these 'transits' are.